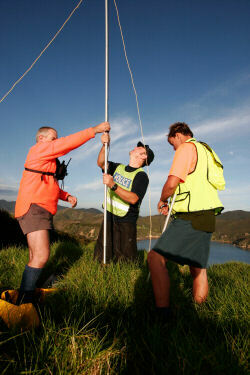 NLSAR is a member of the national organisation, New Zealand Land Search and Rescue Inc. [NZLSAR]. Formed in the 1950’s, Northland Land Search and Rescue (NLSAR) works in partnership with the Northland NZ Police SAR Squad to provide personnel and resources when people are in strife and need assistance. We provide a complete LandSAR service from search parties with specialist SAR skills in the field to Field Headquarters staff for running the search. Our members are a dedicated group of volunteers who search for people who become lost, injured, trapped or misplaced, whether in dense bush, on rugged coastline, offshore islands, on cliffs, down in caves, right across Northland as well as within urban areas. With an ageing population and such illnesses as Dementia and Alzheimer’s seeming to increase, there are more requirements for urban searches for people suffering from these conditions. We are on call 24 hours a day, 7 days a week. Our dedicated volunteers give up their time, often in the night in atrocious weather conditions and difficult terrain, and they do not give up. We have 35 voluntary members, although the number of personnel we have attending any one call out can vary depending on the time of day the call is initiated and they never question why they are out there, searching. A lot of the gear carried is personal gear, purchased by the individuals.